Due to limitations of standard metrology techniques, the measured spectral characteristics of thin-film interference filters are frequently determined inaccurately, especially when there are steep and deep edges. The actual blocking provided by an optical filter is determined not only by its designed spectrum, but also by physical imperfections of the filter, such as pinholes generated during the thin-film coating process and surface defects like dirt or dust. Commercially available spectrophotometers are used to measure the spectral performance of optical filters, but these instruments can have significant limitations when the optical filters have high edge steepness and/or very deep blocking. As a result of these limitations, there are three main discrepancies between the actual filter spectrum and its measured representation (see Fig. 1). The first discrepancy is the "rounding" of sharp spectral features. This is a result of the non-zero bandwidth of the spectrophotometer probe beam. The second measurement discrepancy, limited OD measurement range, is a result of the limited sensitivity of the spectrophotometer. The third discrepancy is unique to measurements of very steep transitions from high blocking to high transmission, and is referred to as a "sideband measurement artifact." This artifact arises from the non-monochromatic probe beam that also has weak sidebands at wavelengths outside of its bandwidth. Semrock utilizes alternative approaches to evaluate filter spectra. 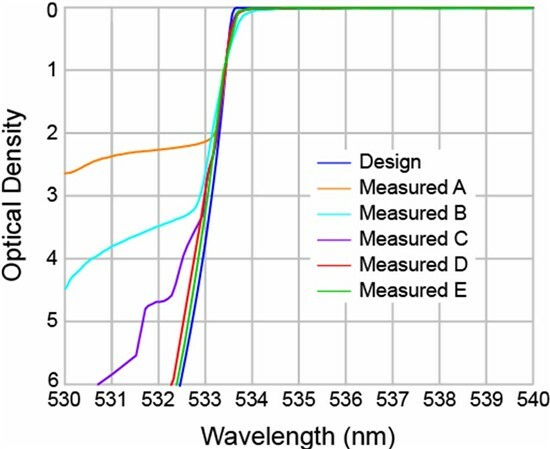 Figure 2 shows five measured spectra of the steep edge of an "E-grade" RazorEdge® filter that is guaranteed to block a laser line at 532 nm with OD > 6 and transition to high transmission within 0.5% of the laser wavelength (by 534.7nm). The measured spectra are overlaid on the design spectrum of the filter (blue line). As observed on the graph, the measurement instrument and technique greatly influences the measured spectrum of a filter. Measurement method A in this graph is from a custom-built spectrophotometer. This measurement uses instrument settings such as short detector integration time and low resolution, as these settings are optimized for very rapid data collection from a large number of sample filters during thin-film filter manufacturing process. However this method has poor sensitivity and resolution. Measurement method B uses a standard commercial spectrophotometer (Perkin Elmer Lambda 900 series). All of the discrepancies between the actual filter spectrum and the measured spectrum as noted above are apparent in this measurement. Measurement methods C and D utilize the same custom-built spectrophotometer from method A. The basic principle of operation of this spectrophotometer is shown in Fig. 3. This instrument uses a low-noise CMOS camera (i.e., detector array) capable of measuring a wide range of wavelengths simultaneously. Measurement method C uses instrument settings (primarily integration time and resolution) designed to provide enhanced measurement of the steep and deep edge, but the "sideband measurement artifact" is still apparent. Measurement method D is a modification of method C that applies additional filtering to remove this artifact. Method E shows the results of a very precise measurement made with a carefully filtered 532 nm laser and angle tuning of the filter itself. Experimentally acquired transmission vs. angle data is converted into transmission vs. wavelength results, using a theoretical model. This measurement method comes closest to the actual design curve, however it is not as suitable for quality assurance of large volumes of filters. 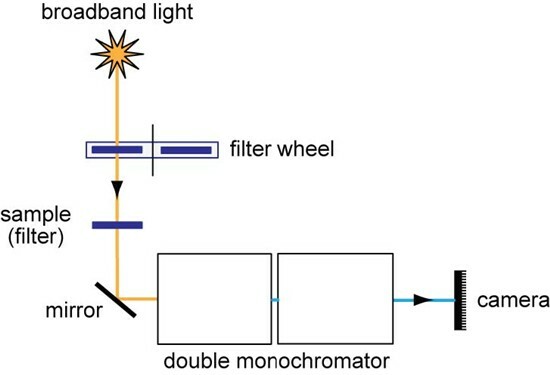 In summary, it is important to understand the measurement techniques used to generate optical filter spectra, as these techniques are not perfect. Use of the appropriate measurement approach for a given filter or application can reduce errors as well as over-design of experiments and systems that use filters, thus optimizing performance, results, and even filter cost. 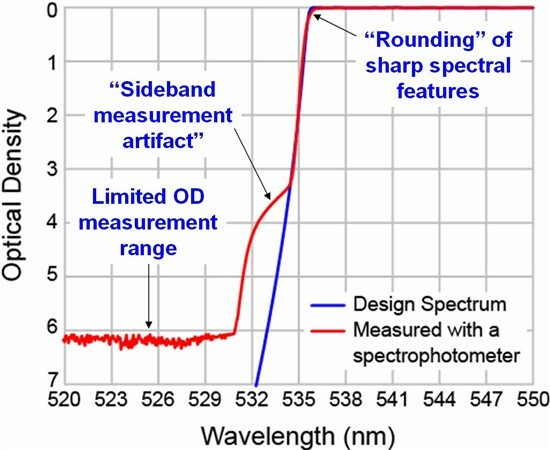 For more detailed information on this topic, download our free white paper Measurement of Optical Filter Spectra.